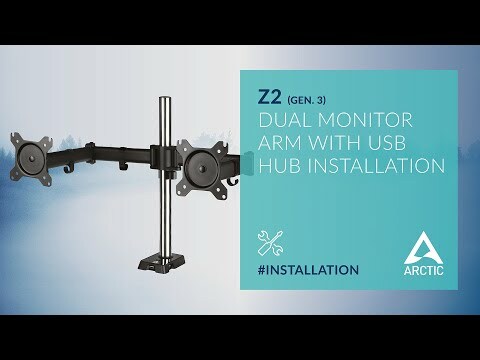 Arctic Z2 (Gen 3) Desk Mount Dual Monitor Arm, Upto 34", USB Hub, Supports Monitors Upto 15kg, Vesa 75mm & 100MM is rated 2.0 out of 5 by 1. Rated 2 out of 5 by Rue12 from Not tall enough for 32" monitors If you like looking down on monitors (yeah right) then buy these, however if you like to look straight into the middle of a monitor then avoid, you need at least another 250mm in length. Maker has cut corners by making the supporting column to short. No surprise this information is not provided by the manufacture, so buyer beware.